Multiplication tables are a challenge for kids to learn, but they could be turned into a game! This procedure aims to explain how to design and create a 3D printed multiplication tables learning tool (mandala) based upon the Montessori method. 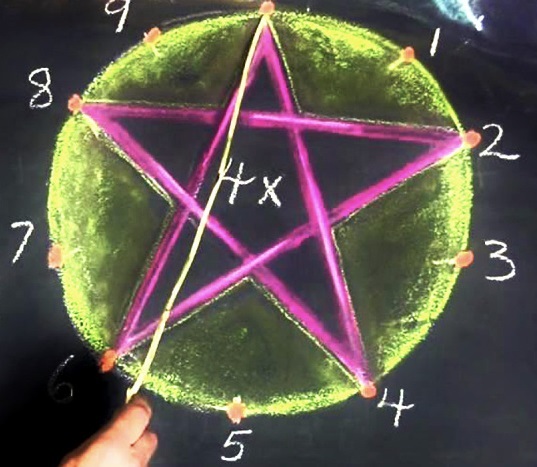 This is usually called the Montessori wheel or mandala of multiplication tables. 3D Printer and PLA material (one color of choice), 1 meter long colored (possibly not the same color of the 3D printed part) wire. While counting the multiplication tables (possible from 1 to 9), the wire must be turned around the corresponding pin (Image 2). For each sequence a different geometrical shape is created on the wheel. For example, by executing the sequence for the four multiplication table a star is created with the wire on the wheel (Image 2). Used 3D printer: Sharebot NG. The project is provided in the spirit of open source and can be implemented, modified and shared according to CC BY-SA license (see footer). No liability is taken for any issues arising from the provided information.